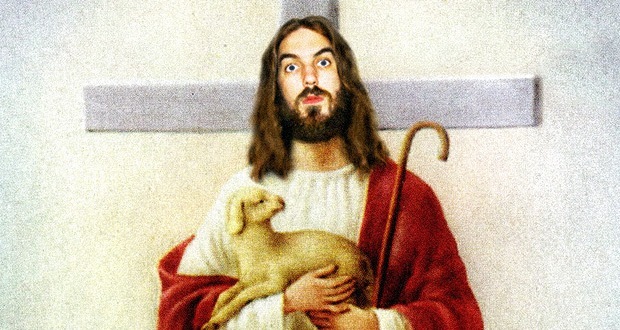 In Josh Ladgrove’s bold, audience-driven comedy experiment, there are no pre-requisites to adhere to before offering up a question, some abuse or even a threat to the crucified parody of our Lord and Saviour. This show comes loaded with potential for complete and abject failure. There is absolutely no pre-prepared material outside of a couple of musical cues ready to be used at the discretion of a tech feeding off the audience’s supply. All that is asked of the audience is to commit the cardinal sin of live comedy, to heckle. A caveat for this review is that this show absolutely is dependent on your audience when you go. A timid audience will encounter one of the most boring, pointless hours of comedy imaginable. An audience with an abundance of character and bold hecklers is a necessity and that can be a difficult dice to roll when considering choosing what shows to see at the Fringe. There is definitely some risk involved. This being Scotland, there are always bound to be some brilliant heckles, from a country world-famous for its patter and ability to quite frankly take the piss. On the night I went, the audience could be split into 4 categories of participants, and I’d hazard that this is a fairly general summary of most shows: the drunks, the smart arses, the quizmasters and the silent majority. Most entertaining of course, are the drunks…until they aren’t. Much like in the real world out with this surreal show, loud drunks are funny for about 10 minutes. Unfortunately, this show is an hour long. Their heckles became less and less funny and Josh had less and less prepared standard responses to offer them in return, meaning the show quickly descended into chants of “Paedo” and “Bawbag” from the back. The quizmasters are the most timid of those engaging in heckling, choosing to ask inconsequential yes or nos, or “what’s your favourite…” type questions. These never bring about more than a chuckle and really demonstrate the show’s paper-thin premise. Any potential for the show to be truly engaging or impressive is shot down by Ladgrove’s refusal to stay in character. This, I thought, completely killed the show. One of the very first questions asked is “Why do you have an Australian accent?”, answered with “Because I’m not actually Jesus, I’m an Australian comedian.” From there the show nosedived. How you can set up a show with such a specific and delicate premise, to absolutely destroy any semblance of a fourth wall is obscene to me. With no Jesus to stop them, the rowdy audience neglected any kind of clever interrogation and resorted to personal attacks and low-brow humour which got very tired, very fast. This wasn’t the fault of the audience necessarily – it was to be expected – but Ladgrove’s reluctance to stay in character for the whole show meant it wasn’t really a show anymore, it was just drunks in a room, shouting at a bearded man.